Visiting MANCHAUG POND and Beyond! Fishing, boating, swimming, and camping are just a few of the activities seen here daily. Motor boats, sail boats, kayaks, canoes, pedal boats, paddle boats and seaplanes can all be seen on the lake throughout spring, summer, and fall. During the winter you’ll find folks ice fishing, skating, snowmobiling, snow shoeing, biking, and cross-country skiing. If you’re an early riser, join the fishing boats on the lake each weekend. Tournaments happen often, and there are some good catches to be found in the lake. Public access through the Mass Fishing and Boating Access public ramp in Sutton. Boaters should note that Manchaug Pond is a shallow pond with a mean depth of 13 ft. A number of hazards including boulders, a stone causeway in the channel, and a sandbar – all of which may or may not be submerged depending on the water level – warrant caution to boaters. Visit our About the Lake and Safe Boating pages for more information before navigating. 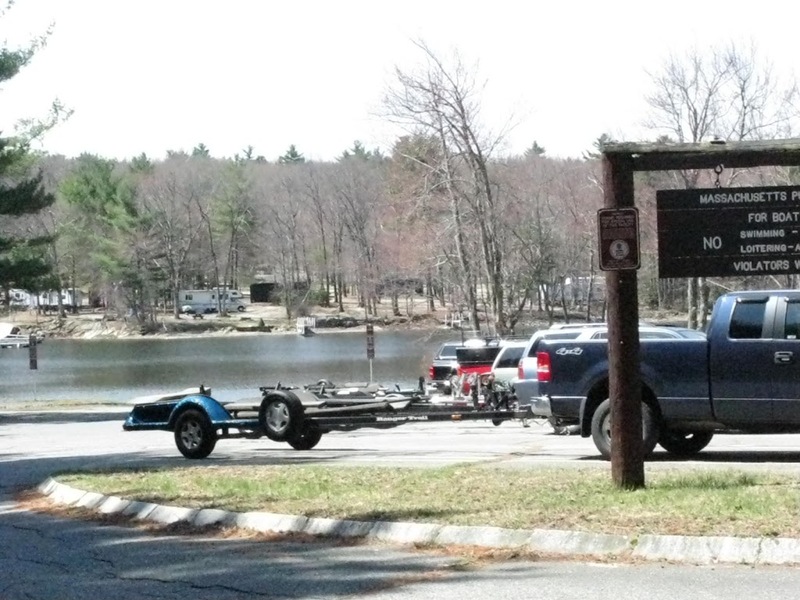 A public access boat ramp, open from dawn to dusk, is offered at Manchaug Pond by the Massachusetts Office of Fishing and Boating and under the management of the Town of Sutton. Weekends can be extremely busy with parking limited. Clubs need to register all events with the state Office of Fishing and Boating Access. Please be sure to be respectful of the rules at the ramp, pay the small fee, and park only on paved, designated parking spots as vehicles parked in inappropriate areas will be ticketed. We also ask that you hose off your boat and trailer at home prior to launching to prevent the spread of invasive species to Manchaug Pond. Rates are $6.00/car/day for in-state and $12.00/car/day for out-of-state. A season’s pass can be purchased at the Sutton Town Hall for $20. Your monies are used exclusively by the town for maintenance and improvement of the facility. Also consider other area lakes: Lake Singletary which offers FREE boat launching at the state DCR ramp and is stocked by the state with trout; Wallum Lake offers two ramps at the 320+ acre lake with one in Mass and one in RI; and the 1200 acre+ Webster Lake which is stocked spring and fall, has award winning size fish, and is an adventure all it’s own! Day swimming and picnicking, fishing and rowboat rentals with a small camp store offering ice cream, candy and more is offered at the Old Holbrook Place for a small fee. Off lake, on Lake Singletary, the town of Sutton offers seasonal beach passes to the town swim beach at Marion’s Camp for residents and non-residents. Three campgrounds on the lake and a fourth just above the lake at the inlet at Aldrich Mill Pond offer overnight as well as weekly, monthly and seasonal camping. Each campground has a unique atmosphere all its own and provide extras from boat docking and rentals, to camp stores, to special activities and events. The Cabin at Hawk Hollow offers a cozy woodland shore retreat where you can stay just a couple of nights or your whole vacation for a quiet, homey nature experience on Manchaug Pond or enjoy a vacation get-a-way in a large Lakefront Home offering peace and quiet with all the amenities you’d expect and so much more. The YMCA of Central Massachusetts offers a summer long outdoor day camp for children entering grade 1 through 7 on the shores of Manchaug Pond at the Camp Blanchard facility. With the mission of preserving the water quality of the 380 acre Manchaug Pond, the Manchaug Pond Foundation secured the 100 acre Beaton Farm property in 2013 through the generous donation of an anonymous donor preserving a significant watershed parcel of feeder streams and ponds. A roadside overlook area originally constructed in the 1980’s by Bradford Beaton allows visitors spectacular views of the gardens, pastures, and forest which cascade to the lake and beyond. Wildlife from rabbits, fox and coyotes are commonly seen as well as the large birds which soar overhead to fish Manchaug Pond – herons,turkey vultures, eagles, and osprey. When visiting, PLEASE… stay on the grass in the roadside overlook area. DO NOT sit, stand, or climb the dry stone walls or fences, no walking on the shed roof, nor entering the neighboring private driveways at the home, the private stables, or private gardens. No vehicles are permitted on the overlook. Please carry out any trash and pick up after your pets. Public parking is available just across the road at Waters Farm Living History Museum homestead – the red colonial house with white trim. NO hunting, horseback riding, boating, vehicles, drone or remote control toy usage, or walking/hiking is permitted on the property in order to protect the extensive water resources in the watershed, ensure the public safety of the many visitors to neighboring Waters Farm as well as the many horses in residence at the private stable, and adhere to the policies and privacy of neighboring properties which must be crossed to gain access to the woodland areas of the Beaton Farm. Hikers are allow across the road on the neighboring Waters Farm property trails according to their rules and policies. Educational events and programs sponsored by the Manchaug Pond Foundation are scheduled and advertised in advance for public benefit. All formal photo sessions, events, and the like must be approved prior to the event/photo shoot by the Manchaug Pond Foundation. the protection of watershed wetland resources. the safety of the horses in residence at the stable. and the respect of the neighbors and the land-use policies of abutting property owners. Visit the Douglas State Forest where hiking trails abound! Hike around the forest with parking just down the road from Manchaug Pond or go further and hike up the Midstate Trail or Southern New England Trunkline Trail. The Midstate Trail passes through the Manchaug Pond watershed to the west of the lake, running north to south across the Commonwealth from Ashburnham at the New Hampshire border through Douglas to the Rhode Island line. Join a group and join others on a day hike picking up the yellow triangles in Oxford, Douglas or Sutton. Purgatory Chasm is a unique natural landmark running for a quarter of a mile between granite walls rising as high as 70 feet. Hiking trails, visitor center with facilities and picnic tables make it a popular destination for picnickers and hikers alike. Shaw Farm in Sutton offers many trails beginning either at the old farm house site off Putnam Hill Road or at the forest trail head parking lot off Central Turnpike. Southern New England Trunkline Trail, offers 22 miles of rail trail which stretches from the Douglas State Forest to the Franklin State Forest. Sutton State Forest with a trailhead on Mendon Road offers a great expanse of forest joining with Purgatory Chasm and the Whitinsville Water Company property. Waters Farm in Sutton offers a mall network of hiking trails as well as events from walking tours of the historical home donated by past MPA secretary Dorothea Waters Moran to the town of Sutton Conservation Commission, to their October Farm Days Fall Festival.